Matt had his senior pictures taken last weekend. Jen, my brother's wife, was kind enough to come out for the weekend to take the pictures. The following pictures are not the senior pictures; they are my pictures of the place we went to have them taken: Mills Ruin Park, which is a fun little park set down by the Mississippi River by St. Anthony Falls, where there are ruins of a grain mill that exploded. There were many people there taking pictures and I can see why. It's a pretty place. 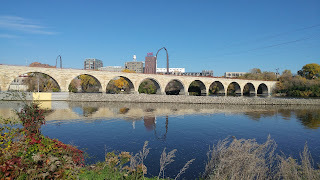 Matt's requirements for industrial, decrepit, and nature were all met in this little park by the stone arch bridge. 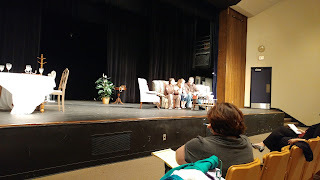 A few pictures from before the play begins. My costumes are compiled (all 3), but I need more jewelry. The hair is still TBD, but the hairstylist says she's going for an 80s Madonna look for me. My bio is written for the program, my lines are mostly learnt. This will be fun! Nov 4-5, 11-12 at Twin Oaks. My little baby chose to grow up, the stinker. He went and turned 18. He's registered to vote, he sports long sideburns and some chin fur. He argues all the time about trivial things and we pretend debate and then it ends up as a "yes way, no way" back and forth. I wish I could remember what those debates have been about because they are really trivial and amusing. Anway, he grew up, dangit. As is tradition in our family, I asked him what kind of cake he wanted, and meant it not just flavor-wise. What theme or design did he want? 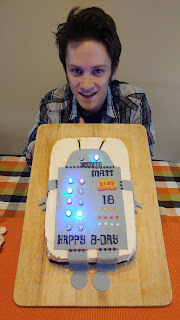 He said, "I've had two Doctor Who cakes, an X-Files cake, and meme cakes in the past. How about robots. I'll leave it to you to interpret it." ...for me as a parent of a band member. 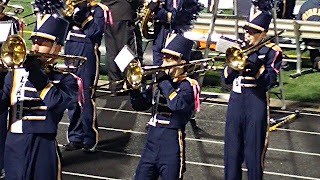 Katie, Paul, and Matt have all participated in marching band, although Katie and Matt are the only ones who stuck it out til they were seniors. I don't think Hayley ever marched except maybe as a 9th grader, and that would have been at only one game. And she probably played the clarinet for it. But I digress. We've reached the limit. Matt will no longer play in the Laker Marching Band at a football game. Later in November, they will have an indoor marching band concert (and that will be our last one of those, closing out our involvement with marching band). Magic the cat escaped the house last night. I came home from play rehearsal with a catnip candy corn mousie for him, but after clicking my tongue as a signal for treats for several minutes with no response, I saw that the deck screen door was open. Magic can open the screen door unless it's taped shut, and guess who didn't tape it shut last night? Not me. I was at play rehearsal. So I went outside to track Magic down, using my flashlight app because sometimes I can spot the kitty's eyes with it, even into neighbors' yards. But after two circuits of the house and several literal cat calls, still no Magic. Jim even tried, although Magic probably wouldn't come in if Jim was calling him.